Sponsored post. Christmas is just nine days away, can you believe it? As I was out shopping yesterday, I noticed people rushing about and acting a bit stressed. All of the last minute gift buying, school Christmas concerts, and planning holiday parties can be very overwhelming for some. Last week, I decided to asked my facebook fans this question. If you could ask an lifestyle expert how to make the holidays less stressful, what questions would you ask? Here's what we came up with. 1. This is my first time hosting a holiday party and I don't know where to begin. Where should I start? 2. I'm hosting a holiday potluck with family. What advice do you have for making it go smooth and stress free? 3. How do I get my kids and husband to help out more with holiday party planning? 4. What is the one thing I should do to avoid holiday party burnout? Well, guess what? I had the opportunity to get advice from someone who knows a thing or two about holiday planning. Watch lifestyle and entertaining expert Limor Suss give tips on how to make your holidays less stressful by answering questions just for Stacie Sayz So readers. How cool is that! Thanks for the great advice Limor! 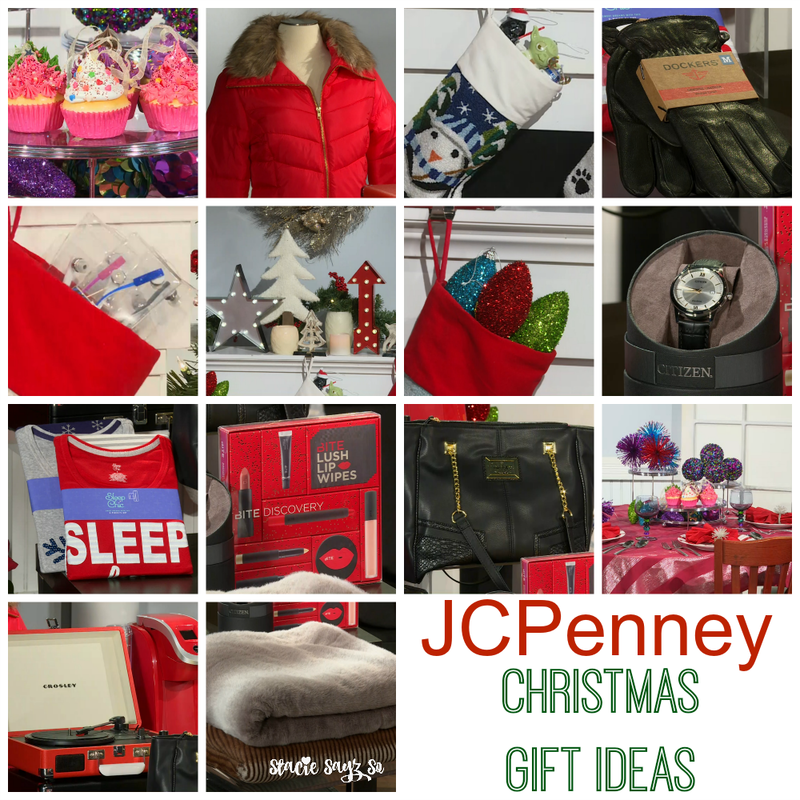 JCPenney wants to help make the holidays less stressful for one Stacie Sayz So reader by providing a $75 JCPenney gift card! Who couldn't use an extra $75 to help with Christmas shopping? I know I could! Leave a comment telling me which tip in the video you like best. For extra entries, use Rafflecopter. This is a fast giveaway and it ends 12/19/15 at midnight. US only. Neither party is responsible for lost or stolen prizes. That it doesn't ALL have to get done. It's ok to let some things go! The LED lights on the mantel are awesome! Now I need a fireplace :) Slow cooking early is brilliant too. For a potluck, get a slow cooker, make something, and transport it to the place of the party, saves time and stress of cooking. Make an appetizer in a slow cooker, cuts down on clutter in the kitchen. I like the Tip about decorating the table and setting the table the day before the gathering. I love her tip in using ornaments as table decorations! I like the potluck tip as well. My favorite tip is to just take some time for yourself! To remember to tell yourself to breathe and that the holidays are supposed to be fun! My favorite tip was to set the table the day before. It's a really good idea - one less thing to worry about day-of! I like the make your food in your slow cooker then just unplug and bring the slow cooker to the party- also bring something you don't have to heat up. I like the stocking stuffer ideas she has. I like the tip to decorate and set the table the day before. I like the tip to use LED marquee lights on the mantle. It really adds a nice touch! I like the pot luck tip the best. I like the tip to give a Keurig mini to the kitchen guru on your list. I like the tip about decorating the table and setting the table the day before the gathering. I like the comment on taking time for yourself. I love the tip to use the slow cooker and cook ahead! I like the LED lights idea! I liked the idea of setting up the table the day before. I like the decorating tips. The LED marquee signs are cute. I really loved the potluck idea for the meal! I think we are going to try that this year....will help so much to have everyone bring something! I love the tip that you decorate the table the day before- that is a great idea and definitely time saving! I love using ornaments as table décor - I just started doing that! There are so many amazing ones now they make a striking centerpiece. I loved a lot of them the decorating tips especially decorating the table in advance. I also love transporting in the crockpot because I do it all the time! I like ornaments as decorations on the table idea. I liked the potluck tip and table decorations. I love the potluck tip. I like the tip about using ornaments as table decorations. I like the idea of using ornaments as centerpieces! I like the tip to set the table the day before. I like the slow cooker/potluck tip. I love my slow cooker and rely on it frequently during the holiday season. It would be perfect for a potluck! I love the faux fur throw gift idea! Love the LED lights on the mantel, great idea! I love the marquis LED lights on the mantle! And decorating with ornaments is so smart! She is so right about getting the table done the day before the guest come. It just seems to take me so long to get that part done. So having it already done is a big plus! I think it's smart to set the table the day before! Use ornaments as centerpiece decorations! Such a cheap, great idea! I like the tip to use ornaments as decorations. Such a great giveaway - I haven't even started shopping yet...I know, but there's still a few more days left! Have a wonderful weekend. I like the idea to make food that does not need heating up...I'm taking that advice for this week's potluck. Getting everything ready ahead of time. I would probably need to start 3 days or so ahead vs the day before she recommends. A.L. I like the potluck tip - glad to know I've been doing something right! I love the idea of setting the table for a dinner party the day before. I never thought of that! I like the ideaof using ornaments as table decor. I liked the tip about using cupcake ornaments as a centerpiece. I like the tip of texting yourself the holiday list. I had never thought of this before. Love the tip to use ornaments as decorations. I love the potluck tips especially - using a slow cooker. I love a beautifully decorated table. And using ornaments is such a creative idea. Great idea for the slow cooker and a potluck! I'm always the type to wait until the last minute to start my Christmas shopping, glad i'm not in charge of the Christmas cooking. I love a good holiday potluck! Living abroad and being away from family and friends back home, its important to not stress over the small stuff and just enjoy the holiday spirit. Thanks for the tips! Great ideas. I did a post to help with making holiday hosting stress-free and shared some of the same tips. Dang it! I totally missed the giveaway but JCPenney has definitely stepped their game up in recent years. I actually like JCP. bummer I missed the giveaway. lol I think potlucks are a great idea. I don't like hosting or cooking like that so one or two dishes (maybe 3) and I'm good. Definitely less stressful than making everything yourself. The holiday season is full of joy and excitement. I don't allow myself or anyone else to burn me out. So sad I missed the giveaway, I'm late! Congrats to the winner! I love the tips from Limor, especially the decorating tips and letting guests take away the ornaments as gifts. So sorry I missed the giveaway :(. I am loving the pajamas - one of my favorite things to buy during the holidays. As far as hosting, accept help and try to relax. My family gets together on Christmas Eve and we've decided to do a brunch.